The new publication compiles all reports from a series of the same name published by the Knight Center blog between the months of December 2017 and April 2018. It looks at journalists and media professionals in the region who are innovating with design, storytelling format, distribution methods, business models, transnational collaboration, residency programs, niche markets and more. The book and the series were made possible due to the generous support of the Open Society Foundations’ Program on Independent Journalism. The book, which can be downloaded for free from the Knight Center’s digital library in English, Spanish and Portuguese, is an expansion of last year’s project, which focused on specific innovations such as fact-checking, virtual reality 360 video projects, podcasting, data journalism and more. This time, the Knight Center focused on the people carrying out these innovative projects. Some are veteran journalists, others have 10 years in the field under their belts, several are just starting and still others don’t consider themselves as “journalists” at all. Many have invested in special positions, teams or labs within their newsrooms to foster and push for innovation and new work culture and thinking. Their news teams themselves consist of professionals with varied backgrounds– journalism, design, law, graphic arts, data analytics and more. They are re-thinking what journalism is, how stories are told and the kinds of information the public wants and needs. Each article is accompanied by key lessons gleaned from the innovators’ stories. During the 11th Iberian American Colloquium on Digital Journalism at the International Symposium on Online Journalism (ISOJ), Teresa Mioli, content coordinator for the Knight Center and an editor of the series and ebook, highlighted five key lessons shared by many of the cases profiled. Journalists representing six cases studies covered in the series were also present and shared their insights on new storytelling formats, ways to expand the reach of content, revenue models that offer hope for attaining financial sustainability, and more. You can read more about their feedback here. The book also includes four guides from prominent Latin American journalists. Natalia Viana, director of Agência Pública in Brazil, gives advice for journalists wanting to carry out successful crowdfunding campaigns. Martín Rodríguez Pellecer, director and CEO of Nómada in Guatemala, walks journalists through financing an independent digital media outlet. Mariana Santos, CEO of Chicas Poderosas, explains how digital journalists can use design thinking. And Priscila Hernández Flores, a Mexican reporter and journalist in residence at Connectas, and Carlos Eduardo Huertas, director of Connectas, offer keys for developing a transnational project in Latin America. Mioli and Ismael Nafría, a former journalist in residence at the Knight Center during the 2016-2017 academic year and author of “The Reinvention of the New York Times,” are co-editors of the blog series and the digital book. The book can be downloaded for free in English, Spanish or Portuguese from the Knight Center’s digital library. Cover art for the book was created by wkrm, a creative design studio run by students at the University of Texas at Austin. 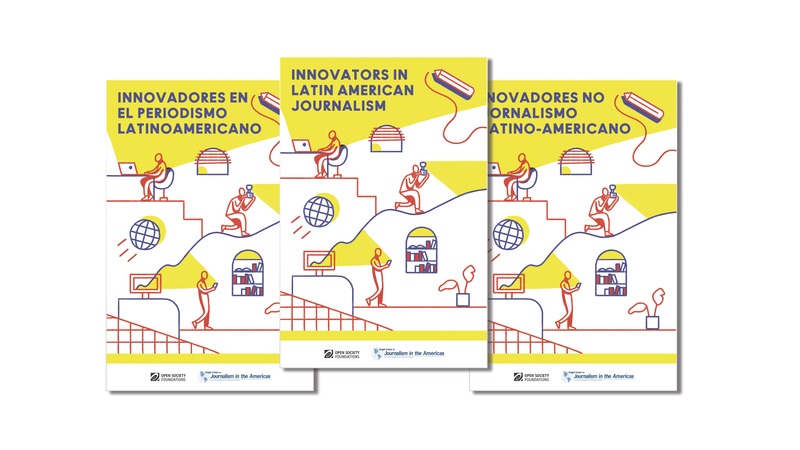 You can find last year’s book, “Innovative Journalism in Latin America,” in the library for free download, also in the three languages listed above.